Le Petit Chateau is an adorable retreat for any person or couple who wants to get away or get to the beach! It sleeps one to two persons and has a full bed, full bath, sitting area, and kitchenette with a microwave, toaster oven, portable electric cook tops, small sink, and mini fridge. The yard is private, quiet, and features native palms and plants. Rates are $75 per night (In-Season) plus a 12% tax and a $50 cleaning fee. There is a $100 REFUNDABLE damage deposit that is returned within 7 days of departure pending no damages or missing items. Rates for drop to $60 per night during the Off-Season. Love the Gulf Coast and had a great time living in Le Shabby Chateau, the main house, next to Le Petite Chateau. 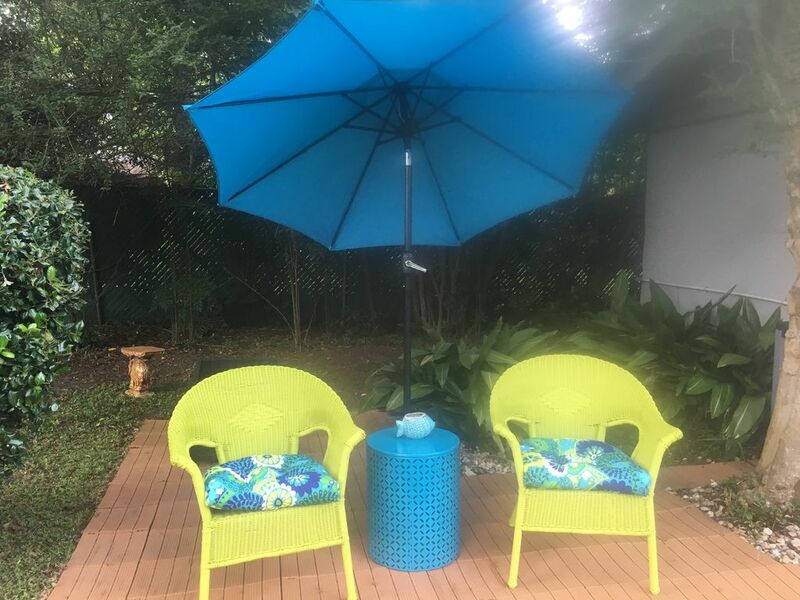 Although I decided to leave the Coast, I couldn't totally give it up, so I turned my property in to a Vacation Rental and have loved every minute of it! I purchased Le Shabby Chateau and Le Petit Chateau as my primary residence in 2006 after Hurricane Katrina. Both were in shambles, but it wasn't long before I had them renovated, restored, and resurrected! Absolutely love anything old -- am an antiquer/junker at heart! Close to the beach, casinos, waterparks, marine institute, space center, booming downtown Gulfport, restaurants, nightlife, shopping, antiquing, deep-sea fishing, and all the rest that the beautiful Coast has to offer. Small kitchenette that offers a microwave, mini-fridge, toaster oven and two electric cook tops. There are plates and pots and pans available, but it really is only suited for light meals. Betsy was very nice and accomidating and if we needed to know anything or if anything was wrong she took care of it immediately. The only problem was that there is no privacy. Only one comfortable chair to sit in. The toilet only has a curtain across not a door. It is close to everything so that was nice. Great location, quiet get away. Place is as described. Had everything I needed but I could not get the microwave to work. Nice place. We loved it! It was perfect for us, enjoyed the laid back atmosphere, everything we needed was there! Would definitely stay again. Very nicely decorated. A little small but has everything you need. I would stay again, but did have a couple of issues. The microwave only has certain buttons that work, so the microwavable meals were a little more of a challenge. Also cooking tripped the breaker several times, luckily I found the breaker box pretty easily behind a picture. There is a dehumidifier in the room but no instructions on how to empty it when it gets full. I was able to figure it out. The bed was super comfy and I slept well. Thanks so much John! And YOU are a great guest! This cottage was perfect for me and my husband with our dog. Decor so cute. It had everything we needed. We will stay here again! Le Petite Chateau Vacation Home Rental is located in the heart of the Mississippi Gulf Coast. Within close proximity to the beach, restaurants, attractions, leisure activities, sports and adventures! Just two blocks from the beach, 5 minutes from the booming downtown district of Gulfport that is loaded with new restaurants, nightclubs, shops, salons, and more, and minutes from the Gulfport Water Park, Space Center, Ship Island Cruises, Casinos, Outlet Mall, Swamp Tours, Waverunner and Parasailing, and sooooo much more! Rates are subject to change until reservation is confirmed. A rental agreement must be digitally signed and information must be supplied to home owner for agreement. The cleaning fee includes damage protection insurance for any accidental damages. Instant bookings denote acceptance of all terms of the rental agreement and rules of the home owner. Certain breeds of dogs may NOT be accepted due to homeowner's insurance. If you have any questions regarding this, please ask.